Glucoronolactone, methylxanthine anhydrous, senegalia berlandieri extract (leaves) yielding 200mg phenylethylamine alkaloids including: B-Phenylethylamine, methylsynephrine, N-Methyl-B-Phenylethylamine, N-Methyl-B-Methylphenylethylamine N, N-Dimethyl Beta-Phenylethylamine), theobromine, naringin (fruit), isopropylnorsynephrine HCI. Malic acid, natural & artificial flavors, sucralose, Acesulfame-K, maltodextrin, silicon dioxide, alum lake red #40, alum lake blue #1. Assess tolerance: MESOMORPH is a high potency formula that may require a gradual dose increase for some individuals. If you are experienced with beta alanine go right to 1 full scoop (MESOMORPH contains 4000g per serving). If you are not experienced with beta alanine start with 1/2 scoop of MESOMORPH. If no tingling or discomfort occurs take 1 full scoop on the next dose and thereafter. If tingling does occur continue 1/2 scoop for 7-10 days then increase to 1 scoop (or as soon as possible). That warm tingle sensation is just Mesomorph at work. Although it can be strong in some, it is not harmful in any way and will subside once body adjusts. Suggested use: After tolerance has been determined 40 minutes prior to workout, mix one scoop of MESOMORPH with 8-10 ounces of water, stir adequately and consume immediately on an empty stomach. On non-workout days, consume 1/2 scoop MESOMORPH mixed in water on an empty stomach. Although you will feel MESOMORPH from day 1, best results begin to occur at day 15 and continue to improve up to day 60. After 8 to 10 weeks, it is recommended that you discontinue use of MESOMORPH and take at least 8 to 10 weeks off before resuming use. During this "off period" you may take a non-creatine product such as PLASMAGEN NITRATE to experience continued progress. Assess tolerance: MESOMORPH is a high potency formula that may require a gradual dose increase for some individuals. If you are experienced with beta alanine go right to 1 full scoop (MESOMORPH contains 4000g per serving). If you are not experienced with beta alanine start with 1/2 scoop of MESOMORPH. If no tingling or discomfort occurs take 1 full scoop on the next dose and thereafter. If tingling does occur continue 1/2 scoop for 7-10 days then increase to 1 scoop (or as soon as possible). That warm tingle sensation is just Mesomorph at work. Although it can be strong in some, it is not harmful in any way and will subside once body adjusts. Suggested use: After tolerance has been determined 40 minutes prior to workout, mix one scoop of MESOMORPH with 8-10 ounces of water, stir adequately and consume immediately on an empty stomach. On non-workout days, consume 1/2 scoop MESOMORPH mixed in water on an empty stomach. As with any supplement, check with your physician prior to use. Do not use this product if you have any current or previous medical condition of any kind. Such conditions may include but are not limited to high or low blood pressure, stroke, arrhythmias or palpitations. Any heart, thyroid, or liver condition. Seizures, anxiety or depression, prostate enlargement or inflammation. Do not use if you are nursing or pregnant. Do not use if you are taking an MAOI. If any adverse symptoms occur discontinue use immediately and consult a physician. Keep out of reach of children. DO NOT take for more than 8-10 weeks without an 8-10 week off period. Malic acid, natural and artificial grape flavor, aceflume-K, sucralose, silicon dioxide, grape skin. Assess tolerance: MESOMORPH is a high potency formula that may require a gradual dose increase for some individuals. If you are experienced with beta alanine go right to 1 full scoop (MESOMORPH contains 4000g per serving). If you are not experienced with beta alanine start with 1/2 scoop of MESOMORPH. If no tingling or discomfort occurs take 1 full scoop on the next dose and thereafter. If tingling does occur continue 1/2 scoop for 7-10 days then increase to 1 scoop (or as soon as possible). That warm tingle sensation is just Mesomorph at work. Although it can be strong in some, it is not harmful in any way and will subside once body adjusts. Suggested use: After tolerance has been determined 40 minutes prior to workout, mix one scoop of MESOMORPH with 8-10 ounces of water, stir adequately and consume immediately on an empty stomach. On non-workout days, consume 1/2 scoop MESOMORPH mixed in water on an empty stomach. Although you will feel MESOMORPH from day 1, best results begin to occur at day 15 and continue to improve up to day 60. After 8 to 10 weeks, it is recommended that you discontinue use of MESOMORPH and take at least 8 to 10 weeks off before resuming use. During this "off period" you may take a non-creatine product such as PLASMAGEN NITRATE to experience continued progress. Assess tolerance: MESOMORPH is a high potency formula that may require a gradual dose increase for some individuals. If you are experienced with beta alanine go right to 1 full scoop (MESOMORPH contains 4000g per serving). If you are not experienced with beta alanine start with 1/2 scoop of MESOMORPH. If no tingling or discomfort occurs take 1 full scoop on the next dose and thereafter. If tingling does occur continue 1/2 scoop for 7-10 days then increase to 1 scoop (or as soon as possible). That warm tingle sensation is just Mesomorph at work. Although it can be strong in some, it is not harmful in any way and will subside once body adjusts. Malic acid, natural and artificial flavors, acesulfame-K, sucralose, silicon dioxide, allum lake yellow #5, allum lake blue #1. Malic acid, natural and artificial flavors, acesulfame-K, sucralose, silicon dioxide, FD&C yellow #5. 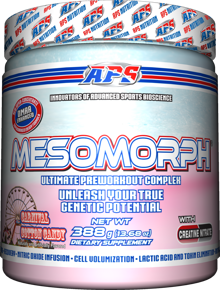 Assess tolerance: MESOMORPH is a high potency formula that may require a gradual dose increase for some individuals. If you are experienced with beta alanine go right to 1 full scoop (MESOMORPH contains 4000 mg per serving). If you are not experienced with beta alanine start with 1/2 scoop of MESOMORPH. If no tingling or discomfort occurs take 1 full scoop on the next dose and thereafter. If tingling does occur continue 1/2 scoop for 7-10 days then increase to 1 scoop (or as soon as possible). That warm tingle sensation is just Mesomorph at work. Although it can be strong in some, it is not harmful in any way and will subside once body adjusts. Suggested use: After tolerance has been determined 40 minutes prior to workout, mix one scoop of MESOMORPH with 8-10 ounces of water, stir adequately and consume immediately on an empty stomach. On non-workout days, consume 1/2 scoop MESOMORPH mixed in water on an empty stomach. Although you will feel MESOMORPH from day 1, best results begin to occur at day 15 and continue to improve up to day 60. After 8 to 10 weeks, it is recommended that you discontinue use of MESOMORPH and take at least 8 to 10 weeks off before resuming use. During this "off period" you may take a non-creatine product such as PLASMAGEN NITRATE to experience continued progress. Assess tolerance: MESOMORPH is a high potency formula that may require a gradual dose increase for some individuals. If you are experienced with beta alanine go right to 1 full scoop (MESOMORPH contains 4000 mg per serving). If you are not experienced with beta alanine start with 1/2 scoop of MESOMORPH. If no tingling or discomfort occurs take 1 full scoop on the next dose and thereafter. If tingling does occur continue 1/2 scoop for 7-10 days then increase to 1 scoop (or as soon as possible). That warm tingle sensation is just Mesomorph at work. Although it can be strong in some, it is not harmful in any way and will subside once body adjusts. Malic acid, natural and artificial flavors, acesulfame-K, sucralose, silicon dioxide, FD&C red #40. Malic acid, natural & artificial flavors, Acesulfame-K, sucralose, silicon dioxide, FD&C red #40, FD&C Blue #1. Malic acid, natural & artificial flavors, Acesulfame-K, sucralose, silicon dioxide, Alum lake yellow #5, Alum lake red #40, Alum lake blue #1. Malic acid, natural and artificial watermelon flavors, acesulfame-K, beet juice powder, silicon, dioxide. Oct 05, 2017 Hi-Tech Pharmaceuticals Raided… Over RED YEAST RICE?? Oct 06, 2015 APS Mesomorph – DMAA Removed!!! This is the DMAA-Free Version! Ultimate PreWorkout Complex! Skin-Splitting Vascularity & Insane Pumps! Ultimate PreWorkout Complex! Skin-Splitting Vascularity & Insane Pumps!Ultimate PreWorkout Complex! Skin-Splitting Vascularity & Insane Pumps! No fillers means no upset stomach or bloating!No fillers means no upset stomach or bloating! The last rep feels like the first allowing you to push harder & longer.The last rep feels like the first allowing you to push harder & longer. Up to 4 times more muscle-building, energy-igniting active ingredients over other leading brands.Up to 4 times more muscle-building, energy-igniting active ingredients over other leading brands. Over 4000mg of beta alanine and over 5000mg of citrulline malate in each serving!Over 4000mg of beta alanine and over 5000mg of citrulline malate in each serving! Most comprehensive Thermo-energy matrix ever put in a pre-workout powder.Most comprehensive Thermo-energy matrix ever put in a pre-workout powder. Skin-splitting vascularity and insane pumps!Skin-splitting vascularity and insane pumps! Maximize Strength, Stamina, & Recovery!Maximize Strength, Stamina, & Recovery! Eliminate Lactic Acid & Toxins!Eliminate Lactic Acid & Toxins! Boost Immunity & Eliminate Free Radicals with Optimal Antioxidant Delivery!Boost Immunity & Eliminate Free Radicals with Optimal Antioxidant Delivery! 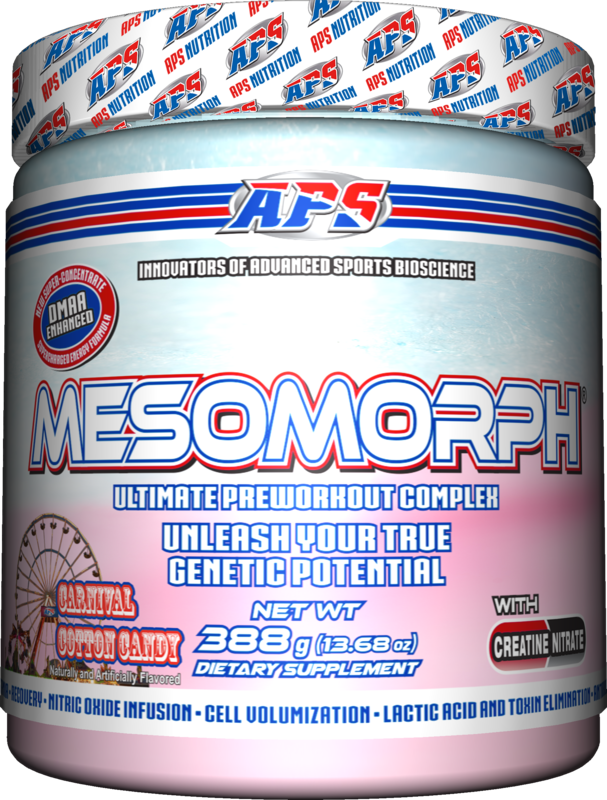 APS Nutrition brings you this state of the art preworkout powder... Mesomorph is your complete preworkout supplement!